As disruption and exponential change confront our institutions and marketplace, our leaders must become agents of “sustainable” transformation. Truly, there is a necessity for “transformative leaders” to address our complex problems of inequality, climate change, job creation, domestic violence and indigenous rights. But who are these leaders? In our world of using the media to share loosely defined concepts and labels, as J.E Rash suggested it is critical that we take the time to define and come to agreement on what we transmit about “disruption” and our leaders of transformation. This is especially important as we discuss our role models inspiring sustainable institutional transformation and social change. So…what do the above leaders (including CEOs, nonprofit leaders, celebrities, educators and political leaders) have in common? ● They are charismatic facilitating significant changes in their work. Because they have all been labeled by the media as “Transformative Leaders,” do they deserve that title? It is necessary to ask– Do they meet the standards and qualifications necessary to claim the honorific? In contrast, a “transformative leader” lives a set of core values and develops a transformative mindset that empowers them to inspire and facilitate significant social or institutional change. To be more precise, they move the needle of change in a direction that will positively affect society… addressing the equitable distribution of power and generating of sustainable resources. Their values translate into consistent action; their words inspire trust, collaboration; their inclusive vision cuts across all “boundaries” They are self-reflective, and humbled by their responsibilities, challenges and results. They are role models that younger people strive to emulate. This title should be reserved for those that truly lead us to more visionary and sustainable outcomes for our business, organizations and society. Is it possible for Nelson Mandela and Vladimir Putin to both meet the criteria of a Transformative Leader? How does Jeff Bezos, the values-driven Amazon CEO, using digital technologies to transform global online distribution compare to Meg Whitman’s (CEO) amazing turnaround of HP? Is President Trumps’ business approach to US government reorganization transforamtive and sustainable invoking trust and support by all Americans and global leaders? Does Oprah Winfrey divide or inspire diverse audiences to serve and promote collective social good? Should the Uber CEO, Travis Kalanick, who built a $60+ billion ride-sharing service, be considered a Transformative Leader with his self-admitted lack of leadership skills? 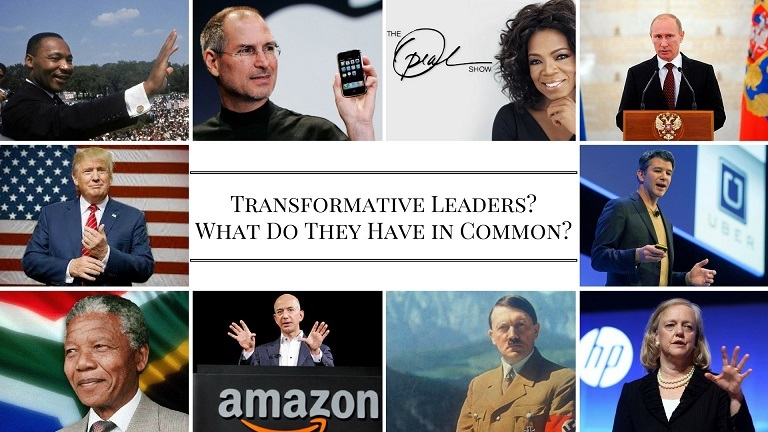 Why define a “transformative leader”? Because there is a transformative leadership crisis. 86% of global leaders surveyed believe that current approach to leadership is a pressing world problem. Klaus Schwab, founder of World Economic Council, noted “Today’s decision-makers are too often trapped in traditional, linear thinking, or too absorbed by the multiple crises demanding their attention, to think strategically about the forces of disruption and innovation shaping our future.” This leadership crisis showcases the necessity for cultivating in our leaders the values, mindset and skills needed to be effective and sustainable in the shifting global digital marketplace. See Part Two: “Are You a Transformative Leader?” to see where you and other leader fit on the Transformative Leadership Continuum.